Do POP Displays Really Work? - The simple answer is Yes! More than 70 percent of all brand purchase decisions are made in-store. In-store sales have increased as much as 65% when POP materials are used. On a cost-per-thousand basis, POP advertising is close to that of out-of-home advertising, or radio, which is about half the cost of TV advertising. In 2014 the average Promotional Program Value (PVV) for in-store POP displays was 499%, which means that for every $1 spent on displays there was an average return of $4.99 in incremental sales. The statistical data speaks for itself, and after more than 25 years in custom POP design and manufacturing and a wealth of industry accolades, experts at Avante have come up with their own top 3 reasons why POP displays really work. Without a permanent custom retail display, you don’t have as much control over where your products will be located. Your product line can easily get mixed in with competing brands, making it easy for consumers to brush right past. With a custom POP displays, there are no missed opportunities. Displays will typically be placed on the end of the aisle or in the centre of a department section, so your products will really stand alone. Many retailers even put displays right in the front of the store near to the check-out because they add to the ambiance of the store. With more interaction in these high traffic areas with sales will naturally increase. Positioning yourself strongly in your market is invaluable to future sales. If consumers are unfamiliar with your products a custom POP display is a great way to call attention to your brand. If your products are already well-established displays can help to reinforce your brand and keep it fresh in the minds of your consumers. More Influence over the Buying Process. POP displays provide an ideal platform for you to better educate consumers about your products, which can seriously influence their decision on whether or not to buy. Graphics, brochure holders or media players that are not available on standard shelving or racks go a long way towards inspiring the consumer and giving them the confidence to take their buying process to the next level. 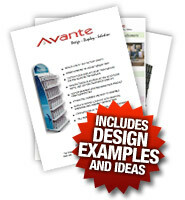 Custom POP displays will increase your profits and provide long-lasting brand recognition. Sales will naturally rise because of increased exposure and consumer interaction with your products. Your return on investment is quickly realized through a steady positive cash-flow, which provides you with the much needed capital to secure new retailers and grow your business. POP retail displays have been proven to consistently out-perform standard store racks and shelving with significant increases in sales and Avante will help you to design the custom display that perfectly represents your brand.